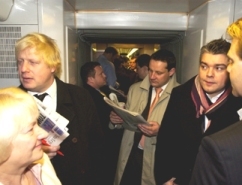 MP Boris Johnson joins commuters in a typically packed corridor on the 7.40 a.m. train to London. Boris takes the (s)train and finds it’s no joke! In fact, it’s a DISGRACE! Since train operator First Great Western introduced a new timetable in December, Henley branch line passengers have been complaining bitterly. After two months, two apologies from First Great Western and minor adjustments to the timetable, and with complaints still arriving on his desk, we asked our MP Boris Johnson to find out for himself how bad the situation is. On Monday he rode with the commuters from Henley to London. Here is his account of the journey. IT’S 6.51 a.m. on a bleak February morning and I’m standing on the platform at Henley station watching a train pull out. It’s the First Great Western service to London; it’s bang on time, and I’m starting to wonder, frankly, whether the outrage is a bit overdone. The train is by no means overcrowded. In fact I doubt whether it is more than one eighth full. There’s no-one standing in the loos. There is no one standing at all. Is this really the service that some Henley commuters have likened to the Black Hole of Calcutta? Are these the travelling conditions that the EU says are unfit for poultry, let alone human beings? So I go into Tubbies and order some bacon and beans on toast. It seems pretty quiet, I say. Yes, they say. Some people are still on half term. Maybe that’s why it’s quieter than normal. I start to panic. What if there is no story here? I can’t tell the travelling public of Henley that I have just tried their morning route, and found it to be perfectly comfortable. At 7.21 a.m. I join David Connop Price from the Henley Standard on the next Twyford train. I confide my fears. What if we discover that the trains are OK? I ask. Look, I say, pointing around the train: there’s bags of room. David gulps. Like me, he can see our story disappearing. No editor is going to print a dispatch with the headline, “Trains More Or Less All Right, MP Claims.”The Standard certainly isn’t going to be interested in a report that concludes “First Great Western Timekeeping Pretty Much OK, Survey Shows”. So we go and ask some experienced travellers. First there is a group of students, Jemima and William Sarson, Mungo Jackson and Tom Walden, all on their way to Reading School. You must be joking, they say. The service is abominable, and the London train is always packed. You may have a seat in Parliament Mr. Johnson, but I don’t think you’ll get on on this train. Then we find Peter Moody, who is familiar to me as one of my regular email correspondents. What does he think of the service? I am afraid he uses a four letter word, beginning with C and ending with P.
“It’s been progressively worse since they changed the timetable in December. There are fewer trains, less choice and there is massive overcrowding both ways. The real test, he says, will be when we change at Twyford. So David and I change trains at Twyford, and my alarm rises. We’re now on the London train — against which Henley people have directed their most furious invective — and once again we seem to be surrounded by empty seats. We find another commuter, Steve Pain of Middle Assendon, and he laughs as he understands our mistake. We’ve got on the wrong train! This is the slow train. It stops all over the place, and it doesn’t get to London for another 50 minutes. Most people simply must be at their desks by 9 a.m., and they can’t afford to catch this one. We should have crossed over at Twyford and got the 7.40 a.m. train to London, he says. But why aren’t you on the fast train? we ask Steve, who works in the City. He laughs again. “Catch that train?”he says. He wouldn’t dream of it. He has decided that he would much rather spend longer on the train, reading and thinking, than be penned in that cattle truck. David and I are starting to feel foolish. We seem to have found just about the only uncrowded First Great Western service in England. Then it hits us. We just change at Maidenhead, and then we can pick up the train in question, the nightmare service from which Steve Pain is a refugee. Then at last we will be able to judge how bad the service really is. So we change at Maidenhead, and wait for the fast London train. As soon as it pulls in, I feel my disbelief rising, There is a huge crowd on the platform, and the train is already so full that people are standing. As the doors open, a queue forms; or not so much a queue as a wedge shaped formation, and one by one the commuters behind force the commuters in front up the steps and into the train. Then the commuters in the doorway start pushing the commuters in the corridor, until the entire corridor is rigid with humanity. It is worse than the Tokyo subway. It is like watching a bolus of food being pressed down the neck of a Strasbourg goose. Soon David and I are wedged tight on a train designed to seat 277 people — but which must hold well over 400. There is no way of counting them. You simply couldn’t move down the cars. “I don’t think I have ever got a seat on this one,”says Natalie Gee, who got on at Twyford. It seems unbelievable that she has a £3,380 season ticket from Twyford to Paddington, and yet First Great Western will not offer her a seat. She has no choice but to get this train, because she would otherwise be too late for work. At last, like a great fat man eating an After Eight at the end of an enormous binge, the train accepts the last passenger. The doors squeeze shut. The Adelante non-stop service from Maidenhead to London lumbers off, some six or seven minutes late, and the passenger complement sways with the motion. We are jammed hip to hip, nose to nape. After about ten minutes it isn’t just the crush that amazes me. It is the stoicism. There is a kind of blitz spirit. People make jokes about First Great Western, Did you hear how they said it was safer to be on a crowded train? Apparently the bodies cushion the blow. Ho ho ho. But when we get to London (about seven or eight minutes late), you can feel their sense of relief and excitement as they get out at last. It is as if they have all been obliged to hold their breath underwater. And then David and I go to look at the train as it waits on the platform, before turning round and heading for Exeter. There are only five coaches. There are five coaches for this enormous crowd of people, many of whom have been paying £5,000 or more for their season tickets. That isn’t a joke. That is a scandal. It is a disgrace. And First Great Western has absolutely no excuse. For more details see The Henley Standard. I’m in the lucky position of not having to worry about the train right, on the rare occasions I do need to go into the office I tend to drive into north London and catch the tube from there. However as more job offers come from places in central London I find myself considering the utter pain of a 1.5 hour journey to get into central London, with no seat, infrequent trains (which become even worse when trying to return after 7pm) and outrageous costs. The pay rise I’d have to request to even cover my costs is pretty obscene and means that I would have to turn down a lot of offers. I very much doubt that Boris, being both famous and an affiable kind of chap, could get a true picture of commuting in London. The miserable gits would more than likely talk to Boris. I can’t even get Andy Burnham to give me a reply! Oh how my jealousy burns. But yeah, it’s just as bad up here. Last week something fell over with Manchester’s Metrolink and the trains every day. It really is quite infuriating. here’s a question for Bullingdon Boris: did you ever stop and think how it feels for a state school kid to arrive at their Oxbridge college to find out that their new college-mates only want to be friends in clubs with their old public-school chums? Holding things that people did when they were 18 against them is pretty pathetic. No decent person gives a damn. NuLab must be pretty desperate if that’s the best they can come up with to smear Boris or David Cameron. It shows their underhand methods clear enough though. What’s next – pictures of them as toddlers fighting with other toddlers? On commuting, I gave it up to work from home and it was the best thing I ever did. If everybody who could work from home, did, there would be much less overcrowding – maybe a subject for government intervention. So Linda, you want to re-engineer one of the world’s finest universities because poor diddums couldn’t / wouldn’t mix with a group of old schoolfriends? There we have it – Socialist thinking at its envious, resentful worst. Was this crushing, scar-inducing experience personal? Did you not not feel the opportunity of studying with future Prime Ministers was adequate compensation for not ending up best mates with them? And is it possible the Bullingdons didn’t want to mix because they can spot a whinger a mile off? Let me tell you about a girl up the road who won a place at Oxford. She’s from a humble home – father a car mechanic, mother a nurse – and went to the local comprehensive. She admits the first few weeks were daunting but after that she found plenty of friends of all backgrounds and went on to have the time of her life. I guess it helped that she’s a leggy blonde with a sweet personality. That’s how the dice fall sometimes. Perhaps you’d be happier if leggy blondes with sweet personalities were barred from Oxbridge too. Welcome to the real world. Worse than the Tokyo Subway? I rode the Tokyo mass-transit system for 20 years (1973-93) and trust me, crowded means taking your feet off the ground and not falling down. But at least the trains are on time. You address road congestion by providing an efficient mass transit system. But it’s a bit late in the day as far as Britain is concerned. No, Andrew. The whole idea of “mass transit” is outdated and very soviet. I’ve banged on about this before – Personal Rapid Transport must be the answer to city congestion and, eventually, to commuter transport. Red Ken would hate it because there’s no-one to fine or rip off. Back to the PRTs are we Paul? Good stuff – I think they’re a great idea. As for Oxbridge: Can’t really speak for others, but I can say that people from public school aren’t immune! I have a challenge making friends, although that might be partly because I’m the only person in my college who’s not training to be a priest, practically the only one who’s under 25, one of few who isn’t married, and also barely Christian myself… However, considering that both Oxbridge universities take a majority of their students from state schools, it’s odd if they don’t fit in. Jack (and Linda), it depends which college and which subject. If you’re in certain colleges, and choose a subject that attracts a lot of public schoolboys / girls like English or History of Art, then yes, you are probably going to have to listen to a lot of braying Eton / Bullingdon people. If that’s going to make you unhappy, then switch Uni’s after the first year. It CAN be done. Sorry Henrietta, can’t do it – I’ve already switched once! In any case, I’m perfectly happy at Oxford, luckily I brought with me some of those fellow public schoolboys Linda despises. Like the Worthing High School Old Boys’ Association is bristling with members from Inverness. Right. And the word is Etonians, not Etons. PaulD: well my experience of Uni is that the Worthing High School Old Boys’ Assoc won’t exist. They’ll just meet up with their friends when they go home for holidays. It DOES seem to be a uniquely public-school thing to form little clubs at Uni with your schoolchums: and it is, on the face of it, a bit shameful since Uni is, in the absence of National Service, the only place where Etons will be thrown together with all sorts. It would be best if Boris spoke out against his University elitism. So should all university clubs be shut down because someone who could not join thought they were elitist. If people dislike Etonions so much then why are they so annoyed at not being able to hang out with them. I know at several universities there are unoffical branches of working mens clubs and I bet you anything ex-public schools pupils cannot join them. All universities also have groups for students from a certain countries, cultures, religions, should these be shut down as they are elitist. I am very proud of the schools, universities and halls I lived in and I am in old girls assoc.’s for all of them because I want to keep up the ties and I do not see why other people find this offensive. A truly appalling situation. You’ll have to walk away from the Railways Act 1993, one of the worst things a Tory government ever did, AND suggest an alternative. End the idiotic franchise system, give companies a long-term future and freedom to do business in-house or outsourced as they choose, freedom to own trains instead of renting them, so you can heavily subsidize actual railway infrastructure instead of giving it all to City consultants and rolling stock leasing companies. You may need to look to unlikely places for inspiration. Example. The USA. Aurora to Chicago Union Station, 39 miles each way, rather like Henley to Paddington, costs about $135 for an unlimited monthly pass (i.e. safely less than £1000 a year), and everyone gets a seat because the trains seat a thousand each or more. Look up Metra, the operator of all but one of the lines in Chicago’s commuter system, and see how it’s done. By the way this off-topic Bullingdon neurosis has to stop. Do you really get anywhere attacking people for what they were 20 years ago? Or does ASBO Britain hold your youth against you forever? Why are you surprised? When you’ve spent five of your most formative years living cheek-by-jowel with friends at boarding school, often clinging together out of self-preservation, of course the bonds are going to be stronger. Is this so “shameful”, Harvey? These are the same forces that bring together war veterans, model railway enthusiasts, and, I dare say, the more extreme ethnic/religious groups that proliferate at university and who pose a far greater threat to the wellbeing of the system. They unquestionably consider themselves a breed apart from, and superior to, the average student. Where’s your equality now, Harvey? This is nonsense, anyone with the most basic of people skills can make friends and drinking buddies in any university. I regularly travel between Reading & Paddington for work. The service is horrendously expensive, rarely ontime, and always overcrowded. Why do we put up with this ? Because we have no option ! As long as Blair & Brown can only think of new stealth taxes to clobber us with, they will never find the time to really examine the Transport Infrastructure of the UK. Unless it merits more Taxes !!! Jack – I meant to say thanks for the support on Personal Rapid Transport (PRT). It beats me why others don’t get more excited about it and why certain people dwell on potential or imaginary snags instead of adopting the pioneering spirit for which Britain was once famous. Just imagine climbing aboard a private pod – one that’s been waiting for you, punching in a central London destination and being whisked directly to the spot in minutes for the price of a bus ride. Transportation in Britain, especially in towns and cities, has become so chaotic that only radical solutions will work. And by that I DON’T mean the Livingstone/Blair solutions based on taxing, spying, restricting, commanding and controlling. I honestly think this is why they cannot get their heads around the PRT concept; the principal of providing a public service that is self-operating and self-regulating is alien to them. For once, just for once, give us a truly innovative solution that provides us plebs with something we actually want – and desperately need. As for the meddling government, we could of course allow some oversight if they must, it would still be a whole let better than we have now – even with thousands of civil servants, a few dozen quangos and 3 or 4 government departments making hundreds of minor changes and millions of legal pages. It would still be much better than the network of tubes and busses at the moment. We could use some specious pretext about hackers/terrorists or health and safety or something, we can’t win every battle at once. Well I’m pleased we agree on one thing Paul. Jack Target – I cannot believe you would not make friends with anyone with intelligence! Actually I have been at the sticky end of the public school divide myself. Not with any of my friends who mostly all went to well known schools but others from schools I’d never heard of before meeting them. My father was, I think, the only one amongst his colleagues who did not believe in public school, certainly for girls. So it is a bit annoying when you know that your father earned more than anothers at the same age and they now look down on you because of a decision you had no control over and was not indicative of your intelligence or merit as a person. As for trains, don’t get me started, they are just so incredibly baaaad. I can’t see it being feasible in a city the size of London. Using the South-Weat trains services around the Richmond/Kingston area to Waterloo. I’ve used this service before. The sheer volume of people that use it too would mean you would need tens of thousands of the things all parked up ready in South-West London in the morning. Now think about the dame happening from every commuter area, hundreds of thousands, perhaps a million of these things all descending on Central London. Where would they all wait? For all its’ faults the Underground is a magnificant achievement if you ask me. They’d do better to extend it out to the suburbs more and relieve stress on the overland services, perhaps with ‘fast’ tubes into the centre, than spend decades inplementing a huge PRT system. People commute from as far as Henly to London, which was the point of the article, here PRT would become unworkable, travelling at top speeds of 30mph. Rush hour trains from Kingston to London (or back) used to be as packed as they could get. They used to run very frequently too. Given the number of trains all descending on Waterloo station, the fact everyone has to diembark, then the drive move off again, I doubt they could have run more frequently than every 15 minutes. The platforms weren’t long enough to take more carriages. What you’ve got in London is too many people for the established networ to cope with. I can’t see a 4-to-a-car PRT system being much good in London given the sheer volume of people to be honest. Fluctuations would be some mornings huge queues would build up and it’d be worse than the trains are. I blame Beeching. Tory Git. K, this is b******s [profanity ..Ed] Please supply details of the “unoffical branches of working mens clubs”. Nobody would go. Everybody knows Oxford has a higher percentage of elitist public schoolers than other universities. It’s even on the increase: “The chances of anyone with an old school tie, especially from a very old school that charges very high fees, winning a place at Oxford have improved significantly over the past five years, it emerged yesterday.” :see Guardian March 5. So Linda, the question is if you don’t like listening to ridiculous accents from boys and girls who spend their lives in a bubble, why did you choose Oxford? Everyone lives in a bubble, public school students at Oxford no less than any others. In fact, due to their prior wealth they often have a much broader experience than most others, having travelled in gap years, taught english in the far east, built wells in Africa, etc. etc.. State school pupils, just like public school ones, come in all shapes and sizes, but there are far more in my experience who have spent almost all their lives in their local area among a closed group of local friends. Perhaps this would be the reason they struggle? In any case this is all a load of old tosh just as Steven pointed out. There are thousands of people at Oxbridge, a majority from state schools, anyone with any people skills at all can find friends without too much trouble. So the clear speech of, say, David Cameron is “ridulous” while the trendy fusion of estuary, faux-northern and gangsta, with the letter T wiped from the alphabet, often delivered in confusing up-speak, is perfectly OK? Before Tammy says “You can’t even spell ridiculous”, it’s my keyboard. re: Nu Labour trying to smear people for what they did in their past…personally I rather like knowing that my representatives are as human as I. And on a truly biased note, at least they didn’t frog march their sons to the police station like that robot Jack Straw…which parent would really do that over a bit of weed rather than handing out a stiff punishment themselves…it was only because of his dad’s job that the poor kid was ‘stung’ by reporters anyway. And another thing. Has anyone considered the possibility that the reason the trains are overcrowded is because they are packed with smelly journalists and bored opposition politicians all trying to milk a few more drops of interest about the state of the railways. Boris, if I see you on the 7.57 from NE Hampshire to Waterloo, I shall insist you travel in the luggage rack. Melissa, you would have to sit on my knee. I will be found (and don’t be too disappointed if you don’t see me there very often, I travel to London infrequently), in the coaches set aside as quiet areas – i.e. the ones with only one person making a noisy call on their phone, and every one tutting quietly. Are you an all quiet mouse Vicus? Either way you’ve won me over by your magic incisive comment laced with sharp wit – you big star! I worked at Great Malvern for a year on work experience and enjoyed it immensely…that was of course until I had to go home to my parents in Essex occasionally. 1) Train to Birmingham and then to London Euston followed by the tube to Epping. Adding an extra hour to the journey but actually cheapest option and more comfortable (if plagued by the strange beeping noises on the Pendolinos). 2) Direct FGW Adelente to London Paddington. Expensive and with horrible overcrowding from Oxford onwards. I’d get the first class upgrade on weekends and the crowds would spill into the first class carridge because there simply wasn’t enough room in standard! A disgusting state of affairs created (quite possibly) by design by First! I’m now back up in Aberdeen, Scotland finishing my degree. Sadly First control Scotrail and their “intercity” service between say Edinburgh and Inverness uses trains which would barely pass for commuter trains down in London. Enjoyed reading your piece Boris. I’ve just seen David Cameron saying “racism is disgusting” on the ITV News. Can’t help wondering what he would have said if a black person had wanted to join the Bullingdon Club. I live in Gloucestershire where all we have to worry about is the sheep and the wonderful views and walks. I can never understand Londoners wishing to live the way you do.I lasted visited London 37 years ago and it was a shithole then. The Japanese put up with this sort of overcrowding all the time and do so without moaning. But then, as in Mussolini’s Italy, the trains are always on time. They are also extremely clean and practically free of pickpockets, so you can relax despite other people being nearer your wallet than you are. One accurate measurement is worth more than 100 expert opinions. Major investment needs to go into the Great Western line to Exeter and the Great Eastern Line to Norwich. Second, both need advanced Virgin like high speed tilt trains used on the Main West Coast Line. They are the fastest and safest train in the UK. Third, both need all high speed trains should be 10 or 11 carriages long and major station platforms upgraded to take this extra capacity.